RON DORFF Skin Discipline Arctic Roseroot Body Scrub (236ml) is a creamy body scrub that has been formulated with Roseroot cultivated from the north Arctic Circle. This anti-inflammatory and energising body scrub leaves the skin soft, smooth and completely clean. The scent is fresh, light and lively, representing the mountainous region of Northern Sweden, Fjallen. 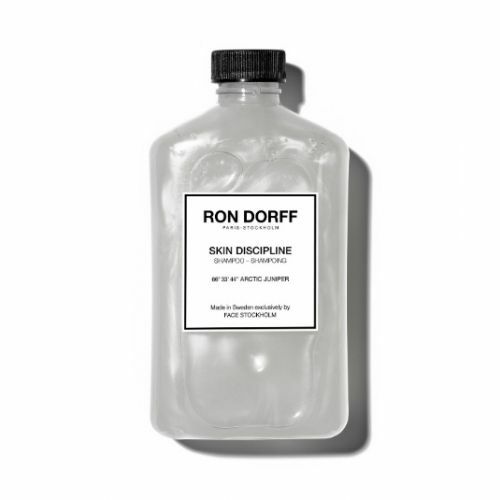 RON DORFF Skin Discipline Body Scrub is unisex. A purifying, exfoliating body scrub, made in Sweden exclusively for RON DORFF by FACE Stockholm. With an all-natural, paraben- and mineral oil-free formula, enriched with energizing and anti-ﬂammatory Arctic Roseroot extract, harvested north of the Arctic Circle, at the latitude of 66° 33’ 44”. It leaves the skin clean, smooth and hydrated. The light, lively fragrance captures the freshness of Fjällen, the mountainous region in the north of Sweden. Suitable for all skin types. No animal testing. 240 ml. Massage RON DORFF Body Scrub onto damp skin and rinse. Use circular motions to apply the scrub. Focus on the upper arms, elbows, knees and feet.